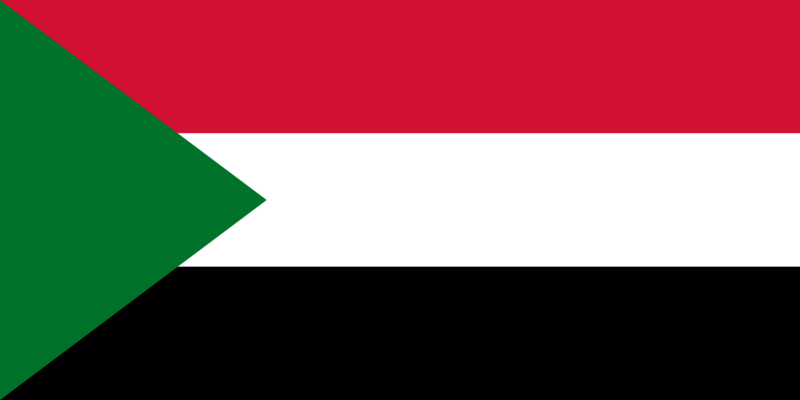 The flag of Sudan (Arabic: علم السودان‎) was adopted on 20 May 1970, and consists of a horizontal red-white-black tricolour, with a green triangle at the hoist. The flag is based on the Arab Liberation Flag shared by Egypt, Iraq, Syria, and Yemen, that uses a subset of the Pan-Arab colours in which green is less significant. Prior to the 1969 military coup of Gaafar Nimeiry, a blue-yellow-green tricolour design was used. Red, white, black and green are called the pan-Arab colours and have been historically linked to the Arab people and Islamic religion for centuries. The colours stand for Arab unity and independence. The red stripe represents Sudan’s struggle for independence and many other struggles, and the sacrifices of the country’s martyrs. The white represents peace, light and optimism. It also represents the White Flag League which was a nationalist group that rose up against colonial rule in 1924. The black represents Sudan; in Arabic ‘Sudan’ means black. It also represents the black flag of nationalists who fought colonial rule during the Mahdist Revolution, late in 19th century. Green represents Islam, agriculture and the prosperity of the land.